This classic meat and vegetable casserole topped with cheesy mashed potatoes is super simple, and always a family-favorite comfort food meal. Shepherd’s Pie proves that comfort food can be fast and delicious. When you see how to make it, you’ll realize you can even make this gluten free casserole recipe on a busy weeknight. 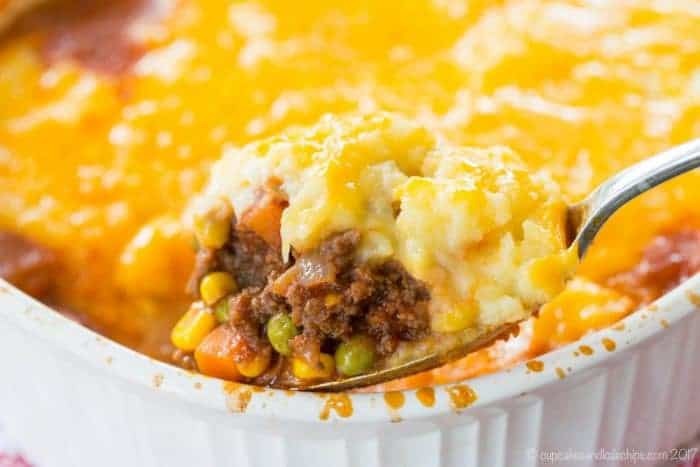 I hope you will add this Easy Shepherds pie recipe to your dinner menu. You can also enjoy it as one of the best gluten-free St. Patrick’s Day recipes. You guys, I don’t know where I went wrong. I swear, through no fault of my own I am raising a trash-talker. He is only 4! Then it was an epic game of Trouble. He was a man on a mission, taking out every opponents’ playing piece in his path. We would all have many turns of NOT rolling a six and not being able to move our pieces out onto the path. Yet the few times he got sent back, he immediately rolled a six on his next turn and could return on his ruthless road to victory. His trash talking was a bit more subtle. Nevertheless, he still managed to throw salt on the wounds. I think it’s time to challenge him to a game of Monopoly to put him in his place. How do I make Shepards Pie? First, pull the frozen veggies out of the freezer and preheat the oven. Next, peel the potatoes, and chop them small so they cook quickly. Then toss the potatoes into a large pot of water and bring to a boil over medium-high heat. Reduce heat and cook until tender. During this time, prepare the meat and veggie mixture. While the filling simmers, drain and mash the potatoes. Finally, add the filling to the casserole dish, top with the potatoes and cheese, and bake for about 30 minutes. Can I prepare shepherd’s pie in advance? Yes, you can definitely make it in advance, and you have several options. You can make the meat and vegetable mixture and store it in the refrigerator for a couple of days before preparing and baking the dish. Another option is to assemble it and refrigerate or freeze until you are ready to bake and serve it. Additionally, you can even bake it and then refrigerate or freeze it. It is possible to reheat it even after it has been frozen. Be sure to thaw it completely and pop in the oven at 350°F for about 20 minutes or more until it is heated through. The potatoes might give off a bit extra moisture, but there is no impact on the flavor. Can you make shepherd’s pie with ground beef? Guess what, I just did! Because you know what? This dish and cottage pie are essentially the same things. Now I’m not sure what shepards pie is, but many people seem to spell it that way. What is the difference between shepherds pie and cottage pie? OK, so there is a difference. This recipe is traditionally made with ground lamb since a shepherd raises lambs. However, I personally don’t like lamb, and I have always seen it on menus, even in Irish restaurants, with this name. And the cottage pie name doesn’t make sense to me anyway since I don’t know any cows who live in a cottage. I’m joking, but the point is, make what you like. 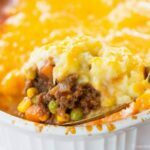 You can always call this recipe “cottage pie” or you can use ground lamb and stick with tradition. I have not claimed this recipe is traditional, I just call it “easy” and it happens to be delicious. Is Shepherd’s Pie gluten free? Many traditional recipes are not, as they contain a brown gravy thickened with flour. However, since this is a pie without a crust, it’s easy to make gluten free, and this one actually is. Just be sure to use Worcestershire sauce that is gluten free (Lea & Perrins is if you buy it in the United States), as well as a gluten free beef broth. The topping is nothing more than mashed potatoes with cheddar cheese. So there are no gluten-containing ingredients there. Go ahead any enjoy this classic dish without worry! The classic dish is meat (typically ground lamb or ground beef, as noted above) and vegetables in gravy, topped with mashed potatoes. But you can put many creative twists on the classic recipe. 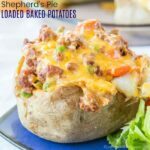 Instead of making mashed potatoes, you can pile the filling into these Shepherd’s Pie Loaded Baked Potatoes. 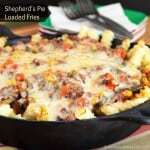 Or put it on top of Shepherd’s Pie Loaded French Fries for a super easy version. 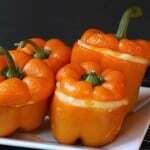 Shepherd’s Pie Stuffed Peppers combines two comfort foods in one. 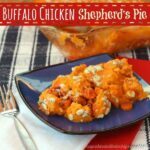 Buffalo Chicken Shepherd’s Pie totally changes up the traditional recipe with a spicy kick and sweet potato topping. Another easy way to enjoy this dish is Meatball Cottage Pie from Taste and Tell. Give it a barbecue twist with Loaded BBQ Pork Potato Casserole from Mom on Timeout. And this Ham and Mashed Potato Pot Pie from Chelsea’s Messy Apron is amazing potato-topped comfort food. I used my Corningware French White Round and Oval Bakeware all the time. 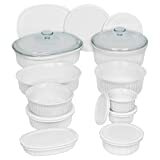 From this recipe to Butternut Squash Macaroni and Cheese and Baked Spaghetti Squash with Spicy Sausage Tomato Cream Sauce or even just reheating a rotisserie chicken from Costco, these baking dishes are in constant rotation. I used the smaller 1.5-quart casserole dish here and had it on a baking dish to catch any drips. If you don’t mind it not being filled to the top and don’t want it bubbling over a bit, try the 2.5-quart casserole. While not the most traditional version of the classic Irish recipe, this dish is easy and delicious. 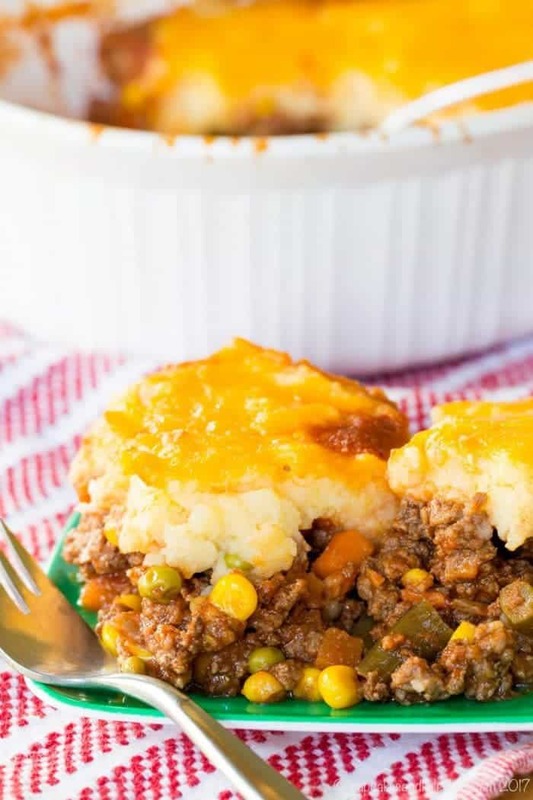 Undoubtedly the whole family will love to dig into this comfort food casserole made with ground beef and veggies, plus fluffy mashed potatoes and cheese. It’s packed with flavors and ingredients everyone enjoys. And it’s great to make ahead of time to reheat when you need it. Plus this version is gluten free. Preheat your oven to 350°F and coat a 1.5 quart casserole dish with cooking spray. Peel and cut the potatoes into about 1 inch cubes, and place the potatoes and a pinch of salt into a pot of cold water. Cover, and bring to boil. Remove cover and boil for 10-12 minutes, until fork tender. While the potatoes are cooking, heat a skillet over medium heat. Add the ground beef, onion, garlic, and a pinch of salt and pepper to the skillet and cook, breaking up the meat, until it is browned. Drain any excess grease. Stir in the tomato paste, Worcestershire sauce, and beef broth. Add vegetables, bring to a simmer, and cook for 10-15 minutes or until thickened slightly. Season to taste with salt and pepper. While the meat mixture is simmering, drain the potatoes and return to the pot. Add ½ cup shredded cheddar cheese, Greek yogurt or sour cream, milk, and 1 teaspoon salt to the potatoes. With a potato masher or hand mixer, mash to desired consistency. Add the meat mixture to the prepared casserole dish, then top with the mashed potatoes and remaining cheese. Bake for 30-35 minutes, or until heated through, and cheese and potatoes are slightly browned. chop and use fresh veggies. I’m an old “duck” and I really think it’s worth it to chew into a good bite of veggie. I’ve been making this for years; when I saw yours it made me feel good that my family old world favorite is your recipe, as well. I like adding a few cloves of roasted garlic into the pool for the mashed potato topping. I’ve made this recipe at least 6 times and it’s become a family favorite. I don’t use all of the worcestershire sauce that the recipe calls for. About 1/8 cup and it’s still noticeable and perfect for our taste. The cheddar in the mashed potatoes gives it something special! Thank you for this recipe! I’m so happy to hear that you like the shepherd’s pie, Jessica! It’s a favorite at our house, too. Thank you for rating the recipe! Anything to substitute broth ?? Brooklyn, if you don’t want to use beef broth, you can substitute with chicken broth or vegetable broth. I suppose you could even use water, but you won’t have as much flavor in the Shepherd’s pie. One of the best things about home cooking is being able to take a recipe and make it your own, Delilah. I’m so happy you found a way to make the Shepherd’s pie the way your family likes it! This looks delicious! Just a quick question….how strong is the Worcestershire sauce in this….is it strong or subtle? Thanks so much! The flavor of the Worcestershire is noticeable, but not over powering. You can easily reduce the amount or even omit it altogether if you want to. I love your version of Shepherd Pie. The French Fries version would be awesome since I also don’t like peeling potatoes. Thank you for all your tips and suggestions. They’re all brilliant. Thank you so much, Shelia! What is the French Fry version, please?